Ms. Ma Yongtian in front of the Chinese embassy in Washington, DC, on her first day of protest. Her name is Ma Yongtian (马永田), a slender, brisk-mannered middle-aged woman. She is a Chinese petitioner. That’s right, one of those poor souls, we see in the news, who look sad and beaten-down and who have all sorts of tragic stories to tell. The only difference is that she has brought her petitioning to the United States. Starting July 1st, Ms. Ma is staging a protest outside the Chinese embassy in Washington, DC, indefinitely, as a new action of the Sparrow Initiative. I learned about the “Sparrow Initiative” from Dr. Yang Jianli, former political prisoner and president of Initiative for China, an advocacy group based here in DC for democracy in China. The first action of the initiative was a sit-in protest staged in 2010 in front of UN headquarters in New York by three Chinese petitioners and victims of forced eviction and demolition, and lasted for about a year. Ms. Ma’s son, a US citizen, participated in that protest on behalf of his mother. The other two participants have since secured settlements with the Chinese authorities and have returned to China. Now Ms. Ma herself has travelled to the US to stage her own protest. Ms. Ma told me her story Wednesday afternoon in Dr. Yang’s office. In the late 1980s and early 1990s, when the waves of economic reform swept across China from the south to the north, the 26-year-old Ma Yongtian bought a 500-square-meter (about 5,400 square feet) property in her native, northeastern city of Changchun (长春), in Jilin province, and opened up a family business that, eventually, hired 50 workers and manufactured Tang tri-colored glazed pottery (唐三彩). Her main product was urns for ashes, and it proved to be lucrative, because, as she put it, “as long as it’s a refined product, no one would want to buy it cheap, or bargain, out of respect for the dead.” Making pottery wasn’t easy, nor was it a local tradition. The plant had technical difficulties in its early days. To solve them, Ms. Ma spent six months in Jingdezhen, Jiangsu province, the capital of Chinese pottery and porcelain, to learn the techniques. From Jingdezhen, she also hired a seasoned technician to oversee production in her plant. When she explained to me the difference between ceramic and porcelain, the physical and chemical transformations that occur during firing, the layout of her plant, the acquisition of raw materials and her sales network across the country, I was struck in awe by the raw energy, the determination, and the managerial smarts of an ordinary Chinese woman. She told me her trouble. I must promptly admit that I got lost in the labyrinth of government offices, developers, courts, mayors, party secretaries, heads of the province, heads of the Changchun municipality, Beijing, black prisons through her 12-year odyssey that began in 2001 and is still ongoing. She had a written summary of her case, from which I was able to get to the main points, but figuring it out, I felt my head was swollen, entangled in thick, sticky and repulsive stuff. While I had trouble sorting out her case, I’m all too familiar with this feeling of mind-boggling tiredness and helplessness. It is an inseparable part of one’s Chinese experience. If on top of it, you are disempowered and wronged by a chain of corrupt officials, but you decided to put up a fight, then that feeling of frustration is only the easiest, and the least painful, of your Chinese experiences. Her case, in summary, goes like this: In March, 2001, a developer obtained a permit from the Changchun municipal Property Demolition and Relocation Office (D & R Office hereafter) without meeting requirements for such a permit. In May, water and electricity were cut off at Ms. Ma’s plant by the developer to force her out. In June, the developer fulfilled all the requirements for the permit and in July it negotiated compensation with Ms. Ma. She rejected the offer because, while her plant was industrial property, the developer was compensating her at the price of residential property, a significant difference. On top of that, about 50 square meters (about 538 square feet) was excluded from the compensation deal. In September, the D & R Office secured a court order to evict her plant “unconditionally without any compensation and arrangements.” In October, a crowd of people descended on the plant, drove everyone out, demolished the property, took away hundreds pieces of her products while breaking others in the process. Ma Yongtian sued the developer and lost. She appealed. This time, she won. The appeal court quashed the original verdict, recognizing Ms. Ma as a victim of wrongdoing during the forced demolition, and ordering the D & R Office to take administrative measures to resolve the dispute. Strangely though, the court rejected her filing for compensation on grounds that her dispute was ongoing and had to be resolved first before seeking compensation. Without an order of compensation, no party in the dispute had to do anything to “resolve” the issue. When Ms. Ma confronted the judge, demanding that he explain the logic of his two rulings, he admitted that the mayor had instructed him to deny the compensation request. Ms. Ma asked the judge whether he was bound by the law or by the mayor, the man couldn’t give her an answer. From 2001 to 2004, Ma Yongtian trudged among provincial and municipal Construction Committees, courts, the Party’s Disciplinary Committees, and procuratorates. She made appeals to the provincial Party Secretary, the governor, the municipal Party secretary, the mayor, to no avail. She once fell on her knees to plead help from the mayor. She got upbraided by the mayor’s chauffeur and secretary as the mayor looked on, only to watch them driving away. Starting in 2005, Ma Yongtian brought her petitioning to Beijing. She became one of the thousands of petitioners captured, and locked up, in Jiujingzhuang (久敬庄), Majialou (马家楼) and the black jails operated by the untold number of “Beijing Offices” of local governments. Two years of petitioning in Beijing yielded hopeful results. The CCP’s Politics and Law Committee in 2007 instructed the local government to address Ms. Ma’s issue. Two hearings were held, but they merely resulted in “separating” her case from the court system involving only the government offices. That way the local court was able to report to its higher court that the case had been resolved. 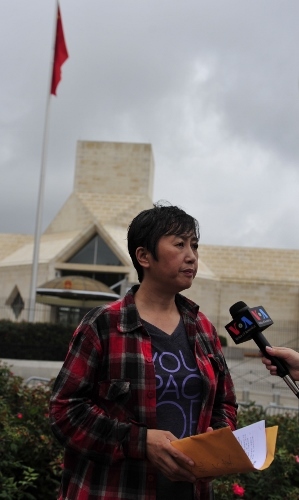 On August 6, 2008, two days before the Beijing Olympics opened, Ms. Ma Yongtian was interviewed by Deutsche Welle in which she revealed the cruelties and hardships endured by petitioners in Beijing. Perhaps her outcry caught the attention of some high-level officials of the state, because the local government sent officials to Beijing, made promises to her, and took her back to Jilin. Once home, she was placed under house arrest. At the end of 2008, the central government once again instructed the local governments to resolve a list of wronged cases, Ms. Ma’s among them. Changchun municipal government was ordered to satisfactorily resolve Ma’s case by the end of March, 2009. The solution, it turned out, was a concerted falsification of documents by multiple functionaries. They altered the address of her property in all the documents. Ma Yongtian pulled a stack of papers out of a red plastic bag and showed them to me. Even in photocopies, the tampering was too obvious to miss: Neighborhood #6, Group #80 (6委80组) was blatantly, and shoddily, altered into Neighborhood #4, Group #80 (4委80组). Several entities and individuals gave false statements that contradicted the facts established in earlier proceedings. In a statement, for example, Judge Jiang Liping (蒋丽萍) of the People’s Court of Nanguan District stated that “When the court arrived at the property of the enforcee Ma Yongtian on October 12, 2001, the enforcee had already vacated her property, under a court order for demolition, of her own accord.” In another statement provided to the city’s Construction Committee, Changchun Municipal Taxation Bureau stated that Ma Yongtian’s company had never obtained tax registration from the Bureau, while it was every party’s knowledge that Ma’s company had registered with the local branch of the State Administration of Taxation. My impression of petitioners is associated with black prisons, often brutal interception efforts by local governments, physical abuses and humiliation. In the streets of Beijing, they are most likely those who unfurl banners these days condemning corruption and calling for social justice. Ms. Ma said she had experienced it all. In the fall of 2006, she was under house arrest in her brother’s home where she had been staying. She scaled the walls and escaped in the middle of the night. People hired by the court hunted her down in two columns toward Beijing. She succeeded in evading them only by transferring halfway from train to bus. But the third day in Beijing, she was captured by a dozen or so of her pursuers, thrown into a van, and taken to the “Beijing Office” of the court. A local court has a Beijing Office too? I didn’t know that before. And the image of a hot chase was simply surreal. In Beijing in 2007, she had been rounded up in Majialou, and she had been locked up in a black prison run by Changchun municipality’s Beijing Office located in Runhua Guesthouse (润华宾馆) at Caihuying (菜户营). The black jail had two rooms, each having a long, raised platform that accommodated many petitioners without separating men and women. A day’s meal consisted of two buns and one large bowl of cabbage shared by all. It was still very chilly in March, and the black jail had no heating. She woke up in the middle of the night, and kept herself warm by running back and forth in the room. After three days, she and a few dozen petitioners were sent back to Jilin where they were locked up until the Two Sessions were over. Her husband had not been a supporter of her quest for justice, and he divorced her in an attempt to stop her (they had since resumed their marriage). Like most Chinese, his belief was that she was not going to win, that the longer she fought, the more she would be hurt—both mentally and financially, and that she should swallow her anger and humiliation and move on. But that’s not how Ms. Ma looks at it. During her detention, she scuffled with the guards/police officers. She refused to squat when ordered to. When a guard asked what her offense was, she told him to ask the policemen who had taken her there. While filling in a form, a guard came up with the charge of “disrupting social order,” she demanded that they tell her how she disrupted social order. In the detention center, she told me, petitioners were those who put up a fight to defend themselves because they were not criminals and often refused to obey. They were punished harshly because of their defiance. A local Public Security chief once cursed her, “You are just a shameless scum!” “How am I shameless? What did I do?” As she recounted it to me, tears welled up in her eyes and coursing down her cheeks in two curved lines. Up to that point, she had been matter-of-factly displaying determination and cogency. She wiped the tears with her hand, but more came. During the Two Sessions in 2012, Ma Yongtian was again in Beijing to petition. She and others were intercepted and herded onto a bus that took them to a black jail. The front of the facility was the Beijing Office of Jilin Province’s Public Security Department, and behind it was a row of one-story houses that served as the jail. Ms. Ma avoided being thrown into the cell by threatening suicide. They left her outside it. Toward midnight, she ran away as the gate opened to let vehicles in and out. Only when she made her escape, did she find out where the black jail was – it was in the area of Marco Polo Bridge (卢沟桥). The fact is, “seeking a chance to speak with officials” has become a highly dangerous act. This much I know: Many petitioners, over the course of their futile struggle, have become someone more than just a petitioner. Some have become conscious political dissenters and activists, and others legal experts keen on the idea of rights. By China Change in Human Rights & Civil Rights, Interviews, Rule of Law on July 2, 2013 .